Have you ever been forced to adjust your mental framework due to new information? Here’s just one simple example. Remember when fat was bad and carbs were good? 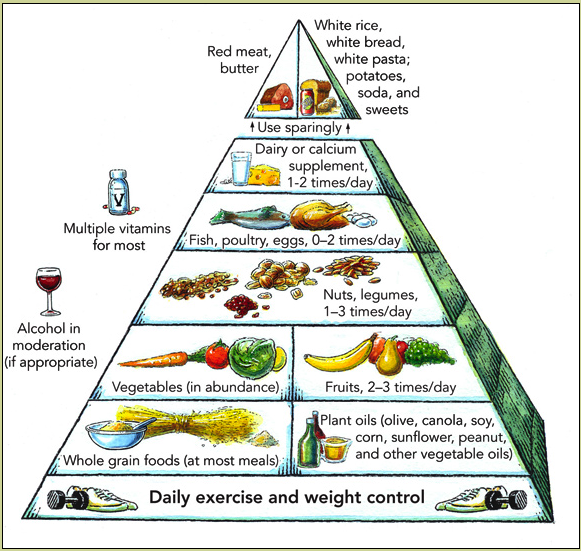 Twenty years ago, or so, under the influence of prevailing wisdom and this handy food pyramid, we ate pasta and bread while cutting back on fats. Not so coincidentally, obesity rates also rose dramatically during the reign of this diet plan. It turns out that our bodies need some good quality fats and that too many carbs actually contribute to weight gain, diabetes and other health problems. (The cynic in me suspects that it was a vast conspiracy by grain producers and cereal manufacturers, but it was probably just misguided science.) Current wisdom looks more like the Harvard Food Pyramid on the right. Dr. Atkins, of low carb Atkins Diet fame, was interviewed by Oprah on her show a number of years ago. I remember watching him explain how one could lose weight by eating unlimited quantities of steak. Oprah was not buying it. And she knew a thing or two about losing weight. I imagine she had a food pyramid paradigm firmly fixed in her mind and could not, at least immediately, process information that did not fit within it. It’s difficult to incorporate new information into already set patterns of thinking. Perhaps the biggest paradigm shift any of us experience happens when we begin to understand who God is. We have been taught by our world, especially the current American consumeristic, individualistic and self-esteem obsessed culture, that life revolves around each of us. We have a tough time shaking the conviction that we are the center of the universe. We most certainly are not. As we get to know God, we learn that He is the Creator, Sustainer, and Savior of this world and that we are along for the ride by his gracious invitation. Faith requires a paradigm shift in our thinking to acknowledge that we revolve around God and his Son, not he around us. 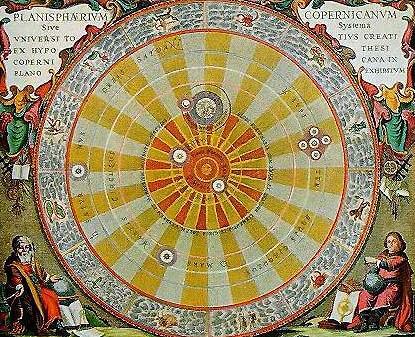 Like Copernicus’s revolutionary heliocentric model of the solar system, when we shift ourselves out of the center of our universes the whole framework and focus of our lives change. During this season of Lent, we prepare ourselves to remember the most paradigm shattering events of human history; the death and resurrection of Jesus Christ. More thoughts on Jesus’s tendency to up-end the conventional wisdom of his day in my next post. Have you experienced any personal paradigm shifts? Gallery | This entry was posted in Culture, Jesus, Lent, Perspectives, Seeing God, Theology and tagged Food pyramid, Lent, Paradigm Shifts. Bookmark the permalink. I have a question for you. I am going to be featuring 31 different people on my blog during the month of January. Would you like to share your testimony or a story of how God brought you through a very difficult time in your life? I think I could do that:) Whould you send me an email (from the contact Judy page) and let me know the details? Thank you for the invitation, and I look forward to hearing from you! I can relate to this, Susie. One of the great benefits of learning to see life with God at the center is that we begin to see ourselves through his eyes. That is very liberating and empowering, isn’t it? Thanks, Susie! I am too sensitive, too emotional, too needy…I am a problem! Like a high-frequency radio I pick up on more than just what a person is saying and pick up on the dynamics in a group. God has wired me with this sensitivity on purpose and I am to put it to good use. I am a feeler and care about the well-being of myself and others. I am passionate about personal growth and love to create safe space to listen to and give voice to matters of the heart. I highly value authentic relationship – with God and with others.